Description: This course is designed to meet the requirements of OSHA for training of first responder operations level personnel who will respond defensively to leaks for the purpose of protecting nearby persons, property, or the environment from the effects of the release. This course is specifically aimed at ammonia users, but will relate to many other chemicals. It can be tailored to other specific chemicals in your workplace. 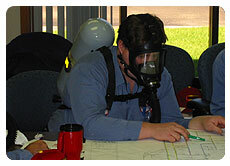 OSHA requires that all personnel who are expected to respond in this fashion to spills or leaks must have this training. At the end of the class the attendees will be required to take an examination and upon satisfactory passing, will be awarded a certificate and a first responder operations level identification wallet card to be used when responding to actual spills.